You’ve had the same water softener for nearly a decade. In that time, you’ve purchased two new televisions, a new (used) car, and even re-did your entire kitchen. It probably still works just fine, right? The real answer may surprise you. The truth is, it is easy not to think about your water softener. It is often locked away in the basement, neglected despite its heroic efforts in saving your bathroom from stains, extending the life of your appliances, and even saving you money on your utility bills. But after about 10 years, the resin in your softener begins to wear, dramatically affecting the quality of your softener. 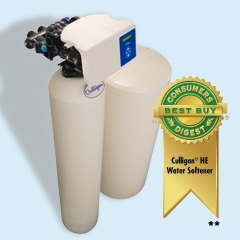 Whether or not you are a Culligan Customer, the Culligan Man is your local water expert and can inspect your softener to ensure that it is working properly. If it’s not, he may recommend the Culligan High Efficiency Water Softener, which is up to 46% more efficient than other leading softeners. Don’t do it yourself, leave your home’s water to the experts. Call Culligan today at 855-Hey-Culligan-Man to get rid of your old softener and to start enjoying the benefits of Culligan Soft Water. Getting better water in your home is easy, just say… Hey Culligan Man!